Pack of 10 colors: Pink, White, Red, Green, Light Blue, Yellow, Orange, Rose, Purple, Milk White. Caliber: 4 inches; Bottom Diameter: 3.5 inches ; High: 4 inches; Total High:6.5 inches..
Material : Galvanized Iron with colorful painting Add a touch of colour to exterior walls and fences with these pretty garden ,Balcony,wall planters. Ideal for brightening up dull brick walls and sheds with your favourite flowers, herbs or plants. Perfect for your deck, patio, front porch, balcony or inside your home Making an attractive focal point on your balcony. Better material: galvanized iron, not easy to rust, more durable, tasteless and non-toxic, suitable for children. Size - Caliber: 4 inches; Bottom Diameter: 3.5 inches ; High: 4 inches; Total High:6.5 inches. 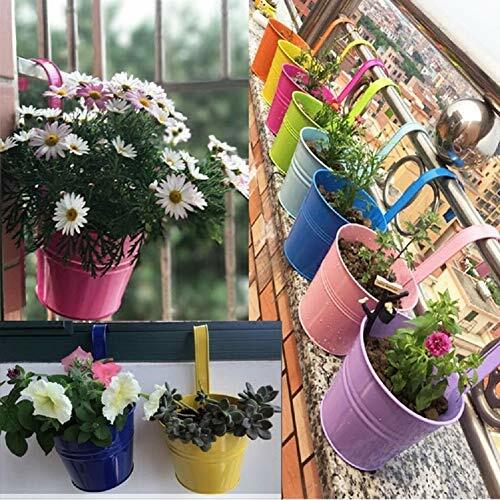 Design: Colorful electroplating spray process, mountable exterior hanging balcony garden decorations, No Drainage Hole Design To Prevent Dirty Scence. Note: Metallic spray paint products may sometimes show signs of collision, paint stains, etc. during transportation, but do not affect the overall appearance. Landscape atmosphere:Decorate your balcony and house. If you have any problem about this flowerpot, just contact us to refund or return, you can be assured that your money will be protected. If you have any questions about this product by KINBEDY, contact us by completing and submitting the form below. If you are looking for a specif part number, please include it with your message.